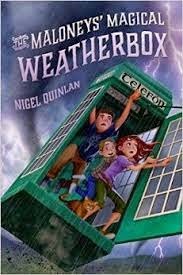 I am really excited to present debut author Nigel Quinlan on the CountdownYA tour today, with one of his first blog posts, I believe! I was already really looking forward to The Maloney’s Magical Weatherbox before this fascinating post, but after reading this post the book is going to the top of my TBR as soon as I get my hands on it! All I wanted to do was write a story about a phone box. That’s how it started. A phone box like the one halfway down the street, next to the Post Office in my little village of Murroe in the Irish south-west. The phone box I had in mind, I decided, belonged to a family who had to look after it, protect its magic, keep its secret. And what was that secret? Oh, it almost didn’t matter. Let’s say, seasons. Better capitalise that: Seasons! The Seasons pass through the phone box four times a year! There you go, simple! Now, back to the family and their adventures. Mum, Dad, Neil, Liz and Owen. The Maloneys. They own a B&B, and the phone box is right next to their house, which is more or less the middle of nowhere and, and yet also one of the four corners of the world. And what happens? Well if you’re a family devoted to the movement of the Seasons, then what’s the most awful thing that can happen? Let’s say, one year, the Autumn doesn’t arrive. There you go! Adventures! Complications! Mystery! Excitement! The difficulty, I thought, would be telling the story of how something as ancient as the passage of the Seasons through the four Doorways of the world ended up happening in an Irish phone box. Phone boxes might seem old and obsolete in this day and age, but there weren’t very many of them around in the Stone Age, which was when the first Weatherman and the elementals that would go on to become the Seasons reached the agreement that allowed humans to get on with their huntin’ and their gatherin’ without getting blown away by a high wind every five minutes. But it turns out that coming up with a mythology based around Seasonal Doorways that stretches from the pale mists of the Paleolithic era to more recent family feuds and skullduggery is actually fun, and sets up most of the plot that gets things rolling and makes life difficult for the Maloneys and their Weatherbox. Weather, it turns out, is tricker. Weather, it turns out, is a right pain in the neck. It’s not so much the weathermagic. You can pop up a load of Weird Weather, threatening snowstorms in September and indoor hurricanes to your hearts content, but when you’re talking about the Seasons, the four Seasons, suddenly you can’t stop thinking. Weather is big. Weather is huge. Weather is global. We breathe air we drink water and all our food depends on weather, the clothes we wear the places we live, whether we could be bothered to go outside today. And then: FOUR Seasons? That’s downright parochial. Lots of places don’t have Seasons as we do, stuck out here on the far edge of Europe, toes dipped in the North Atlantic, with only the Gulf Stream keeping the icebergs and Polar bears at bay. To assume that my big fluffy benign Seasons were proper embodiments of the weather over the whole world at a particular time of the year was daft. Autumn in Ireland isn’t Autumn in a South American rain forest or an equatorial desert or at the North Pole. Oh God, this was exhausting. But I had to work it out. Any of this might be relevant to the plot or the mythology of the book. Most of it doesn’t even get mentioned, because six chapters explaining in detail how the real world and my made-up world interlink kinda threatened to stop the story stone dead, but it’s there by implication. Also, I am bad at science, so I almost certainly getting everything wrong. I worried about this stuff a lot, more than I needed to or should have, perhaps, but it was nothing compared to the headache I gave myself when I remembered Climate Change. I mean, I never forgot about Climate Change, it just took me an awfully long time to realise that if I was writing about weather magic in a setting that is identical, more or less, to the modern world, I really needed to think about Climate Change. So I did. And I worked it out. And then I changed it. And then I revised it. And then I had a great idea that I worked into the plot itself! And then I revised it out in the very next round. So all my tortured thinking about weather is there , just not much of it is on the page. It floats above the book, an invisible mass of air and moisture and fluctuating temperatures and areas of high or low pressure. In places it is completely still, in others it blows a gentle breeze on the reader’s face, and in places it sheets down like silver nails made of water and Vikings. Still, though. The Maloney’s Magical Weatherbox is a story about the Maloneys, their Weatherbox, and their magic. It’s got a bog beast and hags and a tourist of magic and a gang of secret Celtic warrior ninjas. It’s also got weather. Weird Weather. It fits right in. While impatiently waiting for his book, you can follow Nigel on Twitter! And don't miss tomorrow's #CountdownYA post, from Taran Matharu at one of my very favourite book blogs, Snuggling on the Sofa!